Trees are the easy offerings that we humans make at the altar of development. It is often done with impunity and mostly overnight. 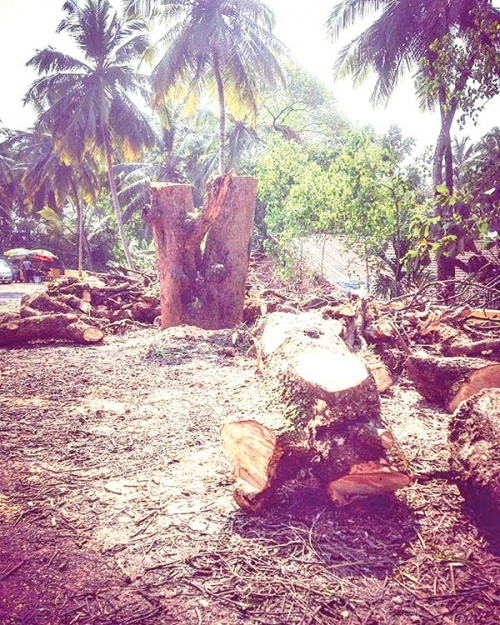 In Goa, as per reports and data from the Forest department, seven trees are being cut everyday on an average. Thankfully the Supreme court has put a stay on Goa government’s cringe-worthy proposal to fell 55,000 trees at Mopa, an eco sensitive plateau, surrounded by forests that is the habitat for protected wildlife, including the gaur, leopard, pangolin and giant squirrels. From centrally funded, big infrastructure projects to the mushrooming of modern villas and buildings in villages or the ever widening of roads, it’s the trees that are the first casualty. Thus began her initiation into documenting banyan trees wherever she spotted them and through social media, urges others to do the same. She adds, “The first step is to be aware of the banyan tree in your midst, take a picture, mark the date and the location which can be easily done using Compass on a smartphone or mark location on a whatsapp location map. Then, share some indication through colour coding on what you think is the potential threat to the tree. Red, if you think it could be under threat - if it’s in the way of electric lines, on the side of the road and hence could be cut for road widening or is just in your neighbour’s way! Green if you think it’s safe and Blue if you really can’t say. The final step is to put it up on the FB page, Goa Banyan Project, email her at goabanyanproject@gmail.com or upload on instagram with the same tag.” The data she gathers is shared with Living Heritage Project, an initiative in collaboration with botanists from the Goa University, that aims to geo-tag heritage trees in Goa. “I find it sad and amusing that trees are also cut because neighbours complain to panchayats of branches getting into their property or of some unfounded threat imposed by a tree to their property,” shrugs Sanober. She adds, “Instead of axing, we need to find ways of pruning and trying to save trees where possible. The banyan tree for instance has huge secondary and tertiary roots that help prevent soil erosion.” She also dismisses claims made by officials of re planting saplings as a trade-off and isn’t hopeful of the survival rate of replanted trees. She asserts, “The older the tree, the better it absorbs carbon from the atmosphere. We can’t replace century old trees from the biosphere and expect the same results that nature has evolved.” It is worth considering that if 100 year old buildings can be classified as “Heritage” and it’s illegal to vandalise them, why is it that the same cannot be applied to 100 year old trees? It is evident that we need more sentinels on ground. This issue is not just endemic to Goa and we pay no heed to nature’s warning. If we were to pay attention, we could possibly hear the trees whisper to each other through the World-Wide web, predicting our impending doom. As Sanober concludes, “Conserving trees and our environment is essential for our very existence. When will we wake up to this fact?” This is the real 10 year challenge that we need to obsess about. ARE THE RUSSIANS COMING IN 2019?